Hi i've been all over the linux website trying to find how i can ADD fonts that i download interdependently of any OS. On windows for adding new fonts you can simply down load them and then paste the opend zip files into the font folder, in Linux i can't do that, so how do i add new fonts, i'm not talking about things like times new roman, i mean things you can down load like the elven fonts from gray company and plant like fonts you can find on google. its driving me nuts most of the fonts i have on linux look rubbish, and the ones I want to download and add are so i can do my design pics with the font styles i need, which at the moment since switching i can not do.. Someone PLEASE help. Can you give some specific details? Your Linux distro / release and a link to some example font would be helpful. Forgot to give credit - I got those instructions from this website. Scroll down to the section titled Linux Font Installation. If you are using Ubuntu then you can check some of the ttf packages in the main repository. You can see the font packages available by opening the console and typing "apt-get install ttf-" and press <tab> to expend the ttf-* packages available. Now I can see that you want to install the fonts you already downloaded, so to do that the best option is to see how ttf package maintainer do it. To do that I switched from the console to firefox and typed ttf in the search box, then I switched from my default search provider to the built-in "Ubuntu Package Search". With the file location and naming convention we can now install fonts without having to tamper the X11 configuration etc. scroll down to The Quenya Font. I am also a total newbie to linux :dry: so a lot of things make no sense to me at the moment. The first command will prompt you for your password (I take it you are administraotr of the box). 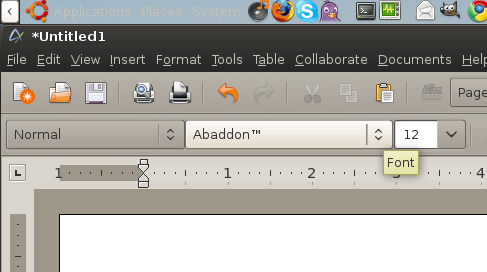 Then I opened Abiword and selected the font menu, moved all the way up (pressing the Home key) and there it was. I guess it'll be very hard to make it any simpler, albeit I'm not 100% sure that the hint file is properly filled (my guess).